In the wake of what has been described as "obscene" intersects at Gold Standard Ventures' newly consolidated Railroad-Pinion project and a corresponding jump in the share price, CEO Jon Awde shares with The Gold Report readers his plans for moving the project forward in 2016. The Gold Report: When we chatted last year, Gold Standard Ventures Corp. (GSV:TSX.V; GSV:NYSE) had just consolidated the Railroad-Pinion District in the Carlin Trend in Nevada and you were doing controlled radio source audiofrequency and gravity surveys on the project. What did you discover? Jon Awde: We discovered there was a lot more going on than we thought, and it led to additional consolidation just east of Pinion to a deposit called Dark Star. The property was cut up and fractionally owned so we consolidated it. We quickly realized that a lot of the previous work that had been carried out on this part of the project was incomplete and that opened up a lot of possibilities. Gold Standard Ventures Property Ownership in Carlin Trend, Nevada. Photo courtesy of Gold Standard Ventures. TGR: You have released test results on Dark Star that Bob Moriarty called "obscene" in a good way. What's your strategy for moving that discovery forward? JA: The Dark Star project is something that we're very excited about. To hit 150-plus meters of 1.5 grams per ton oxide in the Carlin Trend has historically meant you were in a large, robust system. This is our second blind discovery on the project. This just goes to show that our exploration team is very good. This was a systematic, methodical model-driven exploration process. Our strategy is to hit this whole corridor, which from north to south is about 10 miles long. 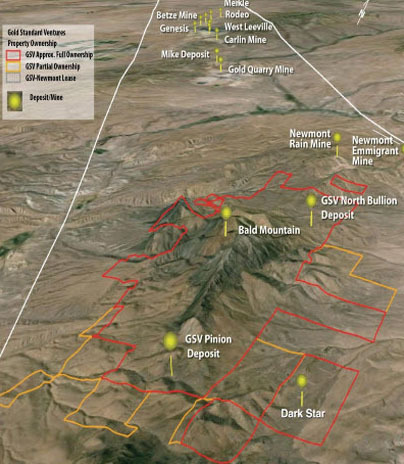 On the southern end is Dark Star, and on the northern end is Newmont Mining Corp.'s (NEM:NYSE) producing Emigrant mine. We think there is a lot of exploration potential along the structural corridor. A lot of that has been made possible because of the consolidation work that Gold Standard has been able to do. TGR: As you mentioned, you have some majors as operating neighbors. Are there some models in Nevada that investors are using to compare your possible future prospects? JA: For Pinion, I think the closest model is Emigrant, a producing mine that belongs to Newmont. It was built in 2012. It's a run-of-mine, heap-leach operation. It has similar grade and characteristics. I think the market wants to see what the metallurgy will look like at Pinion because that is key to the economic model for a heap-leach project. We're doing a lot of that work in that area right now and should have a much better picture in January/February of 2016. TGR: How are you prioritizing your drill targets on such a rich project? JA: We view Dark Star and Pinion as one project with many targets. 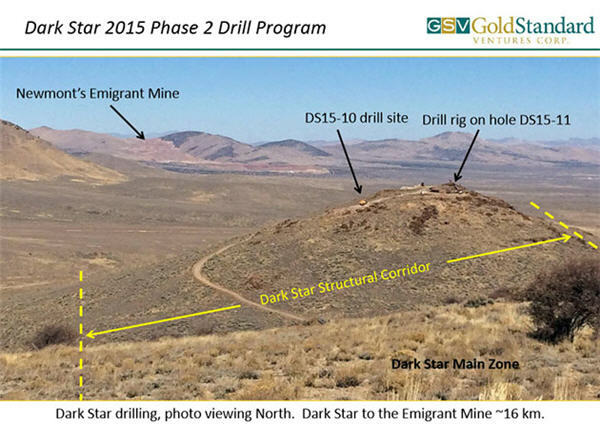 In 2016, our top priority is figuring out Dark Star because those grades and thicknesses are, as Brien Lundin said in his most recent Gold Newsletter, "pretty impressive." At our January budget meeting, we will determine how much money we spend on Dark Star, Pinion and some of the other targets, taking into account what the overall market is doing. Despite the challenging environment for gold companies, this is an excellent time to be exploring when costs are so much cheaper and access to the best tradespeople is a reality. TGR: Are you going to have to raise any money in 2016 to meet your goals? JA: No. That's the great thing about what we did earlier this year in bringing on OceanaGold Corp. (OGC:TSX; OGC:ASX) as a $16.2 million strategic investor. That funded the company and exploration through the end of 2016. Having OceanaGold and shareholders like Albert Friedberg at FCMI Financial Corp. acts as insulation from the overall market. The deal with OceanaGold also brings technical expertise and credibility. Depending on what happens with Pinion and Dark Star, OceanaGold is a phenomenal mine operator. One of our targets in the northern portion of Railroad called North Bullion is a potential high-grade underground target. This company has proven to be excellent at figuring out complex ore bodies and making them work. That is a wonderful asset to have access to at this stage. TGR: What skills does your management team bring to the project? JA: Gold Standard's team is a combination of capital market and exploration expertise. 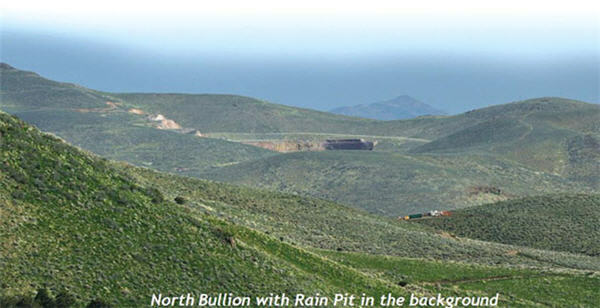 Historically, the exploration team of Gold Standard has had an outstanding track record of making discoveries in Nevada and works really well together. We have an impressive couple of young geologists who have come along and done an excellent job. Our exploration team is led by Vice President of Exploration Mac Jackson who co-discovered Leeville in the mid-1990s. We've been able to raise money in a really challenging environment. We have a remarkable board of directors, and an active advisory board with experts like Jonathan Rubenstein, Ivan Bebek and Jim Anthony. These are men who bring decades of experience in capital markets, mine building, mergers and acquisitions, and discoveries. It's a great position for us to be in to have a strong management team and a board with this kind of experience, wealth and knowledge. TGR: Your stock price has been outperforming the market lately. Are there more catalysts that investors can be looking for? JA: The holes we hit at Dark Star have really gotten people excited about that southern portion of the project. Those are big intercepts. Again, historically, when you see those kinds of intercepts in the Carlin, it can often lead to bigger things. More importantly, this is a district, and these Carlin systems generally don't produce one-offs. They usually offer multiple targets and multiple deposits. We have the second largest contiguous land package in the Carlin Trend behind Newmont. People have recognized that and that explains why the stock has gone up. We spent a lot of time at the $0.50/share level when some people were getting out, then we had those holes and the stock was able to respond favorably because there was less stock to go through. TGR: What's the main thing investors need to know about Gold Standard Ventures and the Carlin Trend? JA: Gold Standard Ventures has a large, contiguous land package, the second largest contiguous land package in the Carlin Trend behind Newmont. The company is well funded and has a great board with a shared vision, and an active management team with a lot of insider buying over the last year in a terrible market and two blind discoveries. We have a shallow oxide target in Pinion and Dark Star. That is something that we could go after on our own. The Carlin Trend is a world-class mining area. Newmont is still finding significant mineralization at Leeville, 20+ years later. These systems typically keep growing and going, with new deposits and new extensions popping up all the time. The effort that we've gone through to consolidate this whole land package is the key factor for what makes Gold Standard Ventures an interesting opportunity. Management has been both entrepreneurial and opportunistic in carrying out the consolidation effort, which assures that management interests are aligned with the interests of shareholders. TGR: And it's a lot safer being in Nevada than, say, Mexico or South Africa. JA: It's a great place to be. Elko is a great little mining town. Our office is about an hour's drive to the project. You can fly into Elko from Salt Lake City. Nevada is consistently in the Top 5 in the Fraser Institute list of mining jurisdictions. There's a rule of law and a clear path to permitting. A lot of expertise lives here. Our team has spent a couple of decades exploring and developing assets in Nevada. Jon Awde is cofounder, president/CEO and a director of Gold Standard Ventures where he oversees all financing, corporate activities and developments for the company. He has spent the last 12 years financing junior resource companies and has focused on institutional accounts, raising over $100 million for public and private companies in the resource sector. Awde received his Bachelor of Arts in economics and finance from Acadia University and is a former sales and trading professional at a CDN Broker Dealer. 1) JT Long conducted this interview for Streetwise Reports LLC, publisher of The Gold Report, The Energy Report and The Life Sciences Report, and provides services to Streetwise Reports as an employee. She owns, or his family owns, shares of the following companies mentioned in this interview: None. 2) Gold Standard Ventures is a sponsor of Streetwise Reports. 3) Jon Awde had final approval of the content and is wholly responsible for the validity of the statements. Opinions expressed are the opinions of Jon Awde and not of Streetwise Reports or its officers.